★ 100% SATISFACTION GUARANTEE - If for any reason you are not completely satisfied with your new cool pillow after 30 days, simply return it for a FULL REFUND. No questions asked! This is a must have if you are someone like me who can't stand a warm pillow. At first I wasn't sure how well this would work. Will it stay on my pillow? Will it move around during the night? Will it be too cold, or not cold enough? Those were all questions I had, and now can answer! This comes with 2 elastic bands that you use to attach it to your pillow. I line them up with the groves on the mat, and wrap the bands around my pillow. Easy peasy. It creates a snug fit and doesn't move around at all. I am a very active sleeper, and if it stayed on the pillow all night with me, then it is definitely secure! On first use, I put it in the refrigerator for a few hours before bedtime. Boy was it cold! I had to let it warm up a tad before I could sleep on it. Talk about heaven! This felt so wonderful, and gave me a great nights sleep. I woke up in the morning, and the mat was still cool. 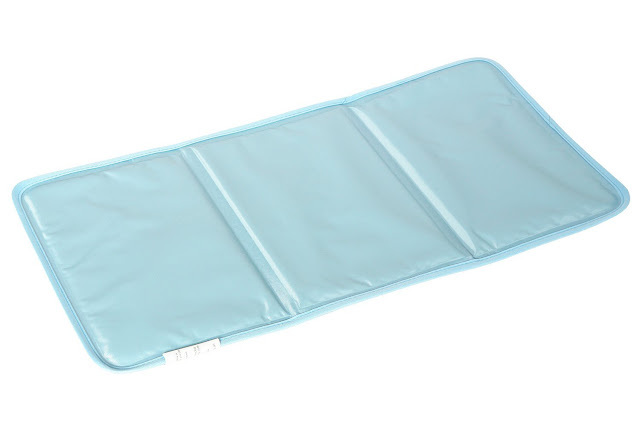 I am very pleased with this PolarGel Cool Pillow Mat! It works wonderfully, and is definitely coming in handy during these hot spring/ summer months!